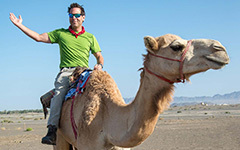 In January I had the good fortune of visiting Oman to explore the country’s magnificent geology. November 18th is Oman’s National Day and in this post I’d like to celebrate an Omani drainage basin: Wadi Bani Ghafir is a watershed in the mountainous terrain of northern Oman that heads about ~10 km (6 mi.) south of Murri, a village just off the main road between Rustaq and Ibri. In January I climbed the Murri anticline and snapped off a GigaPan from the ridgecrest, while Geology Research Fellow Alex Johnson traversed the wadi itself. The desert landscape along Oman’s Wadi Bani Ghafir, note the date palm grove and cultivated area in the middle distance. 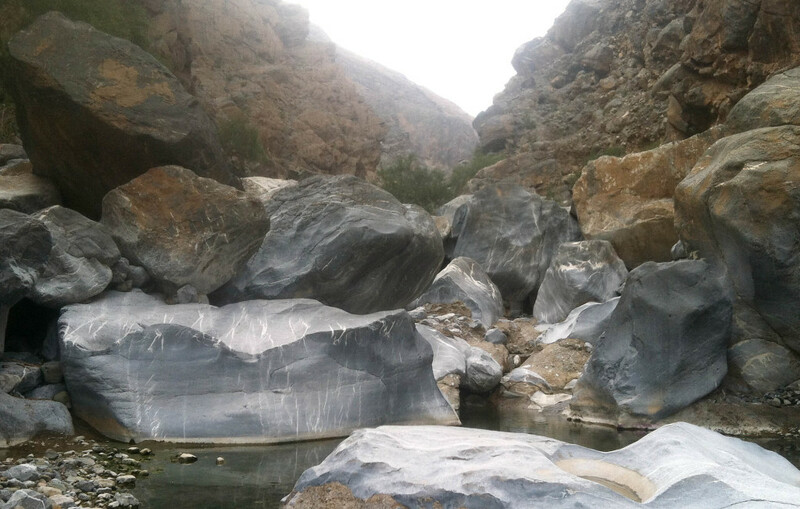 Wadi Bani Ghafir is a perennial stream for much of its 65 km length and as such is dotted with numerous villages and their attendant date palm groves. The wadi emerges from the mountainous Jebel Akhdar onto the broad Al Batinah coastal plain and here its waters infiltrate the permeable sediment and are lost to the subsurface. The uppermost reaches of Wadi Bani Ghafir occupy a valley between the rugged ophiolite terrain to the west and a prominent ridge underlain by Cretaceous carbonate rocks to the east. This 500 to 800 m high ridge is the Murri anticline, a prominent fold that plunges gently to the north-northwest, and at this location the topographic form (ridge) mirrors the geologic structure (anticline). The contact between the ophiolitic rocks and autochthonous rocks is a major fault and the wadi flows along this geologic boundary for ~6 km, it’s not unusual for streams to parallel fault zones, as the crushed and broken rock is commonly more easily eroded than undeformed rock. 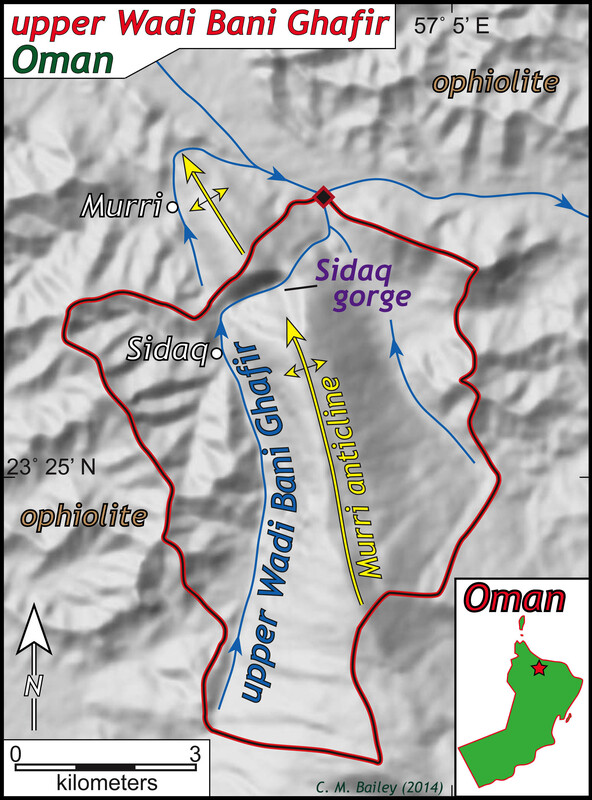 Map illustrating the upper reaches of Wadi Bani Ghafir and the Sidaq gorge, Oman. Bold red and black line outlines the drainage basin above the diamond. But then something curious happens, rather than flow to the north around the anticlinal ridge, Wadi Bani Ghafir makes an abrupt turn to the east cutting the dramatic Sidaq gorge and water gap through the Murri anticline. Western (upstream) entrance to Sidaq gorge. Wadi is just visible at the bottom of photo. Note the shadows in the gorge itself. Photo by T. A. Johnson. As I’ve asked in an earlier post- how can a stream cut a channel across a mountain ridge? It seems to make more sense that Wadi Bani Ghafir would continue to flow along its northerly course until the plunging Murri Anticline (ridge) no longer formed a topographic barrier and then the stream would swing its course to the east. Is the Murri anticlinal ridge, a ridge because the rock layers were folded into a topographic high or is it a ridge because the strata in the anticline are more resistant to erosion than the surrounding rocks? In regions with active tectonics and modern earthquakes (e.g. Iran, Taiwan, and parts of eastern Washington) anticlinal ridges are forming today and in some cases pre-existing streams are keeping pace by cutting water gaps through the rising topography. By-and-large Oman’s magnificent geologic structures formed between 75 and 50 million years ago. Today, Oman is blessed with relatively modest seismic activity. Yet these old geologic structures do offer a clue, recall that the ophiolite originated deep in the mantle and was faulted over the Cretaceous limestones. At some time in the geologic past only the ophiolite would have been exposed at the Earth’s surface while the limestones were still buried in the subsurface. Perhaps an ancestral Wadi Bani Ghafir established its original course on the ophiolite terrain and was later superposed onto the limestones as erosion exposed the strata beneath the fault. 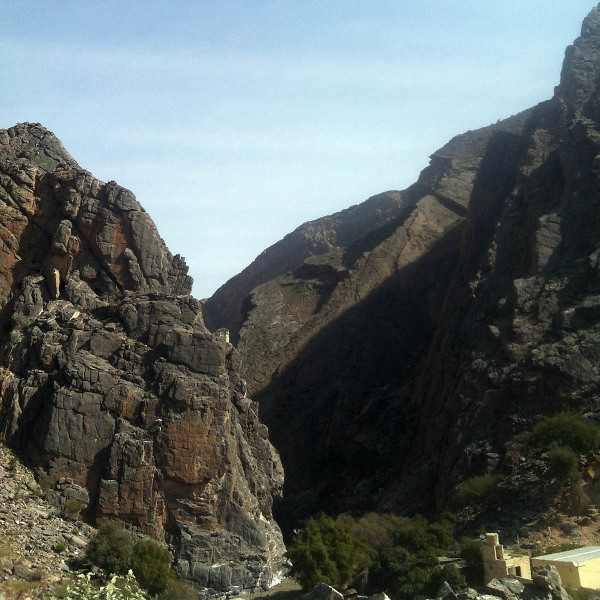 As with many streams the gradient of Wadi Bani Ghafir is steep in its upper reach and lessens downstream, but a prominent knickpoint is developed in the gorge through the anticlinal ridge. Knickpoints commonly occur where streams traverse harder, less erodible rock. When water floods through the Sidaq gorge it must be an impressive sight, or just as likely a terrifying sight — the floor of the gorge is filled with house-sized boulders of limestone. Huge limestone boulders (3 to 6 m) in the bed of Wadi Bani Ghafir in the Sidaq gorge. Photo by T. A. Johnson. This week William & Mary is welcoming an Omani delegation to campus and I’ll be attending the Omani National Day celebration at the Sultan Qaboos Cultural Center in Washington D.C. As William & Mary moves forward with its new undergraduate curriculum I am excited about the prospect of an interdisciplinary W&M study abroad program in Oman. I can’t wait to take William & Mary students into the Sidaq gorge and contemplate the earth processes at work making this dramatic landform.